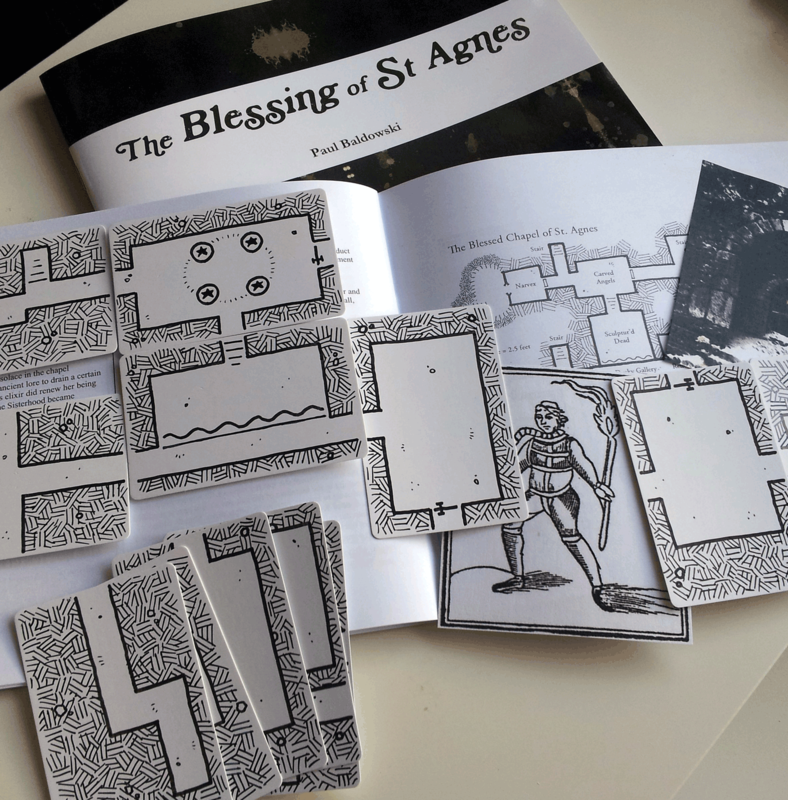 I have been tinkering with the idea of creating geomorph dungeon cards to a design that would allow you to use them when running a game of The Blessing of St Agnes. Once you’ve finished using them for the game, you can carry on using them as a random method of creating other dungeons and structures, but the core of the set would support laying out a map for the players as a point of reference to the adventure. I like the whole (mildly therapeutic) process of creating the geomorph cards. I used a blank playing card stock for the geomorphs and draw on them directly with a Rotring Tikki Graphic 0.4 and a medium Staedtler whiteboard marker. The therapy comes from adding all the hashing that surrounds each element of the map. You add several of them in one direction, then turn the angle of the card and apply more, then turn and again. Eventually, you just start to fill in the gaps inbetween. I have also been working on some additional content for the UK Games Expo edition of the Blessing adventure. You can get the Lulu-printed edition via Amazon at the moment, fulfilled by myself. It might seem odd doing it that way, but it means that I can include the special edition elements in the product that you get sent out to you, while Amazon processes the payments and such. What you get is a one-of-a-kind edition of the adventure, as all the extra bits get cut out and applied by hand. If I can sort out a way of printing the hand-drawn geomorphs on-masse, I will look to offering them as an extra – though I have no clue on the prices of availability. Something for me to consider and work on. Fantastic Maps reshared your G+ post about these dungeon geomorphs earlier this morning and I was admiring them then. They look great and are exactly what I was thinking when I was pondering how to use Short Order Heroes as part of a solo dungeon crawl game. I’m particularly fond of the fact that the orientation of your cards is open to interpretation as opposed to being predetermined. It feels more natural to me and allows for creative construction. Very nice work. Thanks for your kind words. Much effort lies ahead to make a complete ‘deck’, but all this positive feedback from yourself and others goes a long way!